What Are The Best Online Doctorate in Social Work Programs? Graduates of online doctor of social work programs affect social change through leadership, research, and advancement. The Bureau of Labor Statistics predicts a 12% growth in the social work field within the next decade. Social care workers are employed at schools, clinics, hospitals, and other institutions at the clinical and administrative levels. Salaries vary depending on education and expertise. Social workers are integral to the framework of the growing healthcare field, making now the perfect time to earn a doctoral degree in social work. Doctor of social work programs are designed for students and professionals interested in careers in academia or research. Graduates are prepared to work in clinical environments, and many programs offer concentrations, such as medical social work. Students complete residencies to find their ideal work environment. Admission requirements vary by program. Most doctorate in social work programs require one to two years of experience as a social worker. Typically, programs verify work experience by reviewing your résumé and references. Students gain additional work experience through residencies. CAN I WORK WHILE I COMPLETE MY ONLINE DOCTORATE IN SOCIAL WORK? A doctoral degree in social work requires students to apply classroom skills during residencies, which involve real-world situations. Online programs are designed for working professionals, and instructors expect their students to be current social work professionals. Students are encouraged to apply work experience when completing assignments and projects. 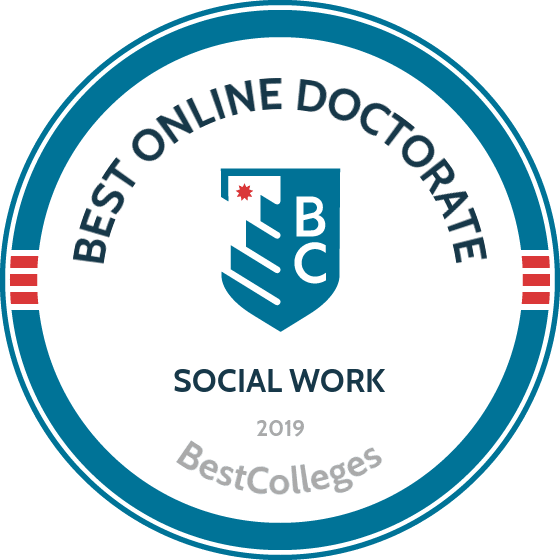 Earning a doctorate in social work online provides flexibility, with courses designed to accommodate working professionals. Programs may be cohort-based or individually paced to facilitate different learning styles. Online students receive one-on-one attention from instructors and can access course materials at their convenience. UT Knoxville offers an online Ph.D. in social work designed to help working professionals advance their careers. The doctor of social work in clinical practice and leadership features a 48-credit professional practice curriculum in an intensive, accelerated format. Most online learners complete the program in three years through a combination of synchronous and asynchronous courses. Cohorts begin the program in the fall semester, and learners take two classes each semester. The curriculum focuses on clinical practice and administrative leadership and includes classes such as psychopathology and psychopharmacology, cognitive behavior, neuroscience for clinical practice, and clinical management. Due to the structure of the program, students cannot enroll part time. The program includes an on-campus residency during the last week of June, which involves a one-week focused-study seminar. Applicants must have completed two years of post-master's, supervised direct practice experience with an at-risk population. While applicants must submit GRE scores, UT Knoxville sets no minimum test score requirement. While some out-of-state students pay a higher tuition rate than Tennessee residents, the university offers in-state rates to residents of states that participate in the Southern Regional Education Board's Academic Common Market. UT Knoxville holds regional accreditation from the Southern Association of Colleges and Schools Commission on Colleges. In 2007, the University of Pennsylvania's School of Social Policy and Practice introduced its doctorate in clinical social work, the nation's first practice doctorate. Unlike research-based Ph.D. programs in social work, Penn's DSW program prepares students for administrative leadership and teaching roles. Learners complete online coursework and dissertation research simultaneously, which appeals to working professionals. Students can earn the online Ph.D. in social work in two years, although most learners require three years. The hybrid program delivers courses synchronously during two evenings each week, and students attend two five-day residencies at Penn's Philadelphia campus. The first residency unites new students for an immersion experience in late August or early September. Learners attend the second residency during the summer session after their first year. During their first year, students take classes on foundations in theory, research, and clinical practice. Second-year coursework emphasizes applied clinical practice and teacher preparation. Third-year students do not complete any formal coursework; instead, learners participate in a dissertation seminar that provides the structure and support they need to complete and defend their dissertation. Applicants must have a master's degree in social work (MSW) from an accredited program, a minimum 3.0 GPA, and at least two years of post-MSW clinical practice experience. Penn holds regional accreditation from the Middle States Commission on Higher Education. The University of Southern California offers an online doctor of social work program geared toward working professionals who want to improve their practice and gain opportunities for career advancement. This 42-unit, advanced practice degree prepares social workers to develop innovative solutions to practical problems. The curriculum emphasizes innovation and leadership and prepares students for advanced management practice in complex systems. Online learners complete coursework synchronously and asynchronously, and most students earn the online Ph.D. in social work in two years. Distance learners must attend six-day residencies during the third and sixth semesters of the program. Students can fulfill the residency requirement in Los Angeles or the District of Columbia. USC's doctoral program incorporates the 12 grand challenges for social work, an initiative developed by the American Academy of Social Work and Social Welfare. The agenda emphasizes social justice, economic inequality, and child and family welfare. Required coursework includes classes in informatics and social innovation, leading public discourse in social work, and managing innovation and change in social work. Students complete a capstone research project based on one of the grand challenges. Prospective students must hold an MSW from a program accredited by the Council on Social Work Education. Applicants with at least five years of professional experience receive preference. Applicants must have a minimum 3.0 GPA in undergraduate and graduate coursework. USC holds regional accreditation from the WASC Senior College and University Commission. The online doctorate in social work from the University of St. Thomas prepares students for teaching and leadership positions in higher education. The program prepares scholars and practitioners for faculty positions in higher education. Coursework covers topics including curriculum development, assessment and evaluation, and program administration. Students complete a "banded" dissertation comprising a series of three critical works linked by either theme, issue, pedagogy, or population. During the dissertation process, learners create two publishable articles and either a third article, a presentation, or a BSW or MSW course. UST delivers coursework synchronously and asynchronously, and the online Ph.D. in social work program uses a cohort model. Students complete one course at a time, taking two eight-week courses each semester. Distance learners typically complete the program in three years, and they must attend two on-campus residencies in Saint Paul, Minnesota. Each residency lasts two weeks, and they occur after the student's first and second years. Applicants must hold an MSW from a program accredited by the Council of Social Work Education and must have at least two years of post-MSW professional practice. Applicants with higher education teaching experience receive preference. Applicants must have a minimum 3.0 graduate GPA, but UST does not require applicants to submit GRE scores. UST holds regional accreditation from the Higher Learning Commission. Each program has unique learning objectives and outcomes to prepare students for careers in social work. Specific curricula vary by school, but students complete core and elective classes and residencies. Each doctor of social work degree program has unique requirements, but the courses below are common to most doctorate in social work programs. Interpersonal psychotherapy: Students develop skills necessary to assist patients with strained interpersonal relationships. Students learn to apply psychotherapy techniques to client interactions to help clients build stronger relationships with family and friends. History and development of social work: This course covers the history of social work and welfare. Students study foundational concepts and explore the effect of past social justice issues on the modern world. This course prepares students for careers in research. Advanced social work theory and practice: Students explore the ideals and concepts that shape modern social workers. They learn about social justice and how social workers contribute to community welfare. Students learn how services social workers provide shape individuals and families. Future clinical and medical social workers will benefit from this course. The number of required credit hours impacts degree completion time. Each curriculum meets learning objectives, which vary by program. Most students complete their doctoral degree in social work in three to five years. Typically, programs require at least 71 credit hours. Most programs require students to take at least two courses per semester, but whether a student studies on a full-time or part-time basis also affects completion time. Individually-paced, asynchronous programs may be completed more quickly, as students complete assignments on their own. Cohort-based, synchronous programs involve working with a group of peers and may take longer to complete. Regional and national accreditation are the two most common forms of accreditation within higher education. Regional accreditation is handled by six geographically dispersed agencies. The U.S. Department of Education (DOE) and the Council for Higher Education (CHEA) oversee these agencies. Regional accreditation is the most prestigious, and credits earned from these institutions are easily transferable. National accreditation is handled by CHEA-approved agencies, which evaluate accredited schools every three to five years. Most vocational and technical schools are nationally accredited. Nationally accredited programs are typically less expensive, but degrees from these schools are not as widely recognized. The DOE allocates federal funds to public and private institutions within the U.S. school system and monitors schools to ensure adherence to federal regulations. The Council for Social Work Accreditation is a specialized agency that reviews social work programs, in conjunction with the CHEA, to ensure programs meet rigorous standards. For a list of accredited schools, visit the DOE or the CHEA website. Online doctor of social work programs increase graduates' earning potential and open doors to the best social work job opportunities. The table below highlights common career paths for graduates of doctorate of social work online programs. Most positions involve working with clients, but graduates also work in administration and research. Graduates of social work doctoral programs pursue careers in research, teaching, and practice. Social work professionals work in clinical settings to assist people struggling with addictions, mental health issues, and interpersonal relationships. Graduates also serve on administrative boards, supervising a team of social workers and implementing policy changes. Researchers work with doctors to perform clinical studies and document findings in scientific journals. Medical social workers interview clients to understand their medical history. They refer clients to specialists, arrange transportation to appointments, and offer advice. These social workers identify cognitive or mental issues. They serve as a client's support system to help them identify and reach personal goals. Clinical social workers are licensed and trained to provide clients with therapy. They also coordinate other health services for clients. Pediatric social workers help children and their families identify health-related issues and cope with illness. They also help families find health services and providers. Instructors help students grasp social work concepts, policies, and procedures. They work with students at the undergraduate and graduate levels. Professional organizations help social workers grow personally and professionally by providing a support system. Many organizations hold conferences across the globe. They provide job opportunities and career counseling for both recent graduates and experienced professionals. Most importantly, these organizations are committed to social justice reform; they advocate for policy change and implementation. The NASW is the world's largest social work organization. Members build professional relationships with social workers worldwide. With chapters in more than 116 countries, the IFSW works in conjunction with the United Nations and UNICEF to further social justice and relief efforts around the world. Australia's premier professional organization for social workers, the AASW works to improve social work education and policy reform. All graduate students should complete the Federal Application for Student Aid (FAFSA), which is handled by the DOE. Eligible students receive aid in the form of loans, grants, scholarships, and work-study programs. Graduate students may also fund their education by working as research or teacher's assistants.